Laser beams are well-documented to chase away pest birds. The beam seeks out their roosting-spots, alarming and confusing them, and they flee. This technological breakthrough makes current hand-held, labor-intensive lasers obsolete - and opens up this proven method of bird control for general industrial use. 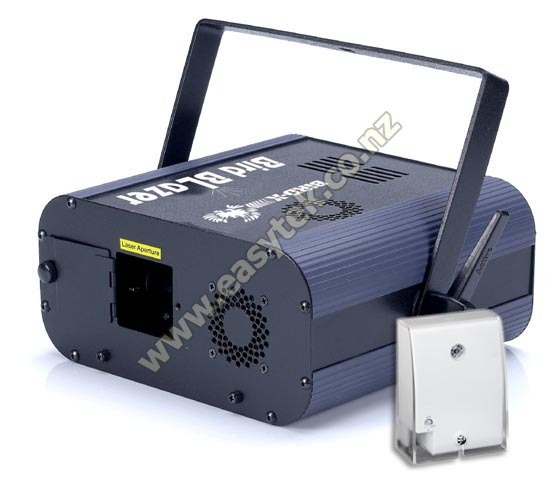 The Bird Blazer Laser Bird Repeller uses a Class 3R diode “fat beam” laser featuring strong 10 milliwatt (mW) green beams. The beams create 45 different patterns occurring in random order. This new unit also features a sensor module for fully automatic operation. After an initial set up, the laser device will automatically operate at night and protect vacated buildings from bird pests. The laser remains off during day time allowing staff to safely enter and work inside the premises. POWERFUL GREEN LASER. 10 mW of fat-beam laser power. The green laser light has been shown as the most disruptive to birds. EASY OPERATION. Remote control for ease of operation. Security keys to maintain control. LARGE COVERAGE. Maximum range 1000 feet/ 300 meters in the dark. The coverage area is up to 10000 square feet/ 929 square meters. SAFE OPERATION. 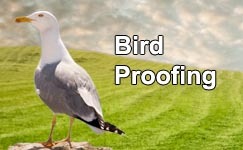 Bird-X Bird Blazer is a state-of-the-art consumer-safe device. QUICK START BIRD CONTROL. Bird Blazer comes with six-foot power cord, 2 keys, remote control, mounting hardware (consisting of hanging bracket, 2 clamp levers and 2 washers) and an instruction manual. The Bird Blazer is designed to act as an important aid in chasing birds from their infestations in plants, warehouses, loading docks, railroad sidings, tunnels, breezeways, underpasses and storage sheds. Other locations include: hangars, silos, barns, stadiums, arenas, boat houses and bell towers.